This loud, stupid, belligerent movie will make you think of Wall Street times ten played on a wall of giant amps, but it somehow manages to be entertaining in spite of itself. 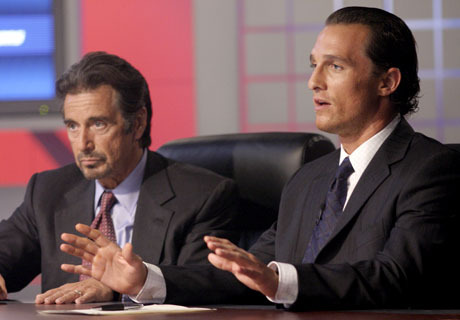 Matthew McConaughey stars as a wounded footballer who's got a line on how to pick the winners; he's soon wooed away from his 1-900 line by master odds maker Al Pacino, who's a bit of a gambler, both literally and figuratively. Soon, McConaughey is isolated from his love of the game and becomes a creature of the bet, and his 80-percent prediction rate drives him straight to the top, until a cold streak and the boss's recklessness threaten to sink the whole enterprise. The hilarious mismatch of the easygoing McConaughey and wheezing shouter Pacino - the latter of whom is in full Scent of a Woman "hoo-ha" mode - is what gives the movie its fascination; it's as if two life forms from different planets were somehow cast in a movie set in a milieu where neither would be caught dead. Neither the grandiloquent elder statesman nor the "what, me worry?" young Turk seem suited to the mad focus of sports betting, but their total capitulation to something so utterly unsuited to them takes the film from the merely obnoxious to the ludicrously howling.